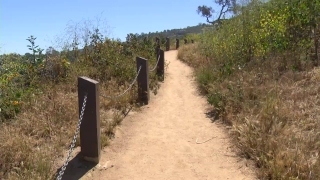 File image of a hiking trail. A ground search and rescue operation for a missing hiker in the area of Muir Beach in Marin County ended Tuesday afternoon, a Golden Gate National Recreation Area spokeswoman said. Tyler Silva, 21, of Antioch, was hiking with his girlfriend near Pirate's Cove Trail at Muir Beach when the two separated, according to GGNRA spokeswoman Dana Polk. Silva was last seen on a cliff and he was reported missing Sunday, Polk said. Crews with the Marin County Fire Department, Southern Marin Fire Protection District, Marin County Search and Rescue, National Park Service and Marin County Sheriff's Office searched trails in the area on the ground and by air Sunday and Monday and concentrated the search in the cliff area until 4 p.m. Tuesday, Polk said. It's possible Silva fell from the cliff and was swept out to sea, she said. The National Park Service is investigating Silva's disappearance, Polk said.